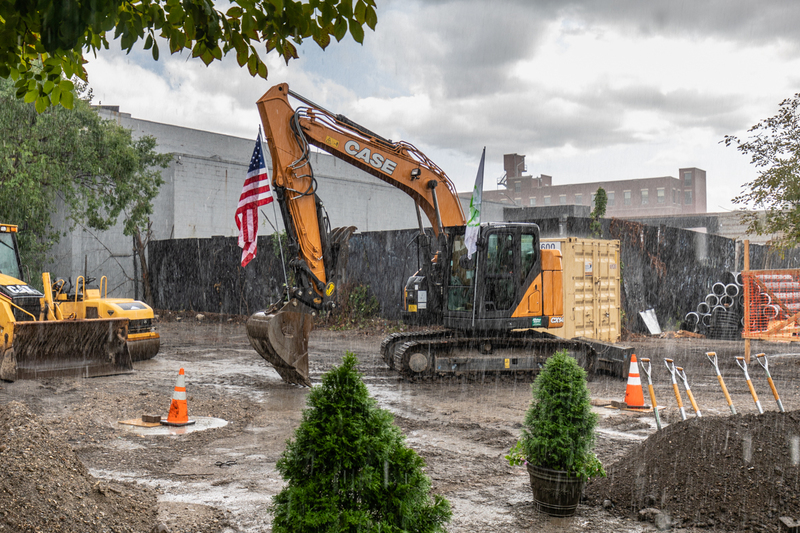 GOWANUS – As heavy rain poured onto Brooklyn Wednesday afternoon, the city marked the official start of the $3 million Ennis Playground renovation with a groundbreaking event that parted the clouds and proved a small victory for Gowanus residents. More than two years after funds were committed and following a community-led redesign process in 2016, construction for the updated playground is now underway and scheduled to be completed by July 2019. 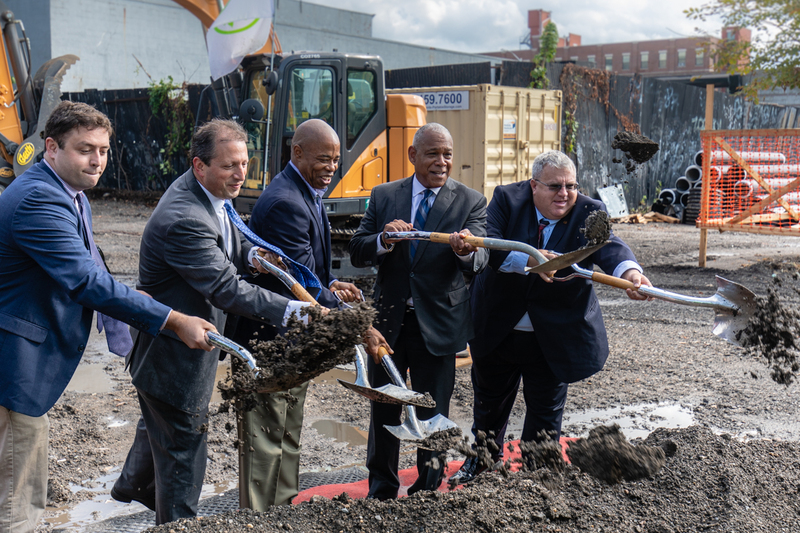 The future of the Gowanus neighborhood is getting increased attention lately with the recent announcement of a neighborhood rezoning framework and the EPA’s dredging of the infamous Superfund site. 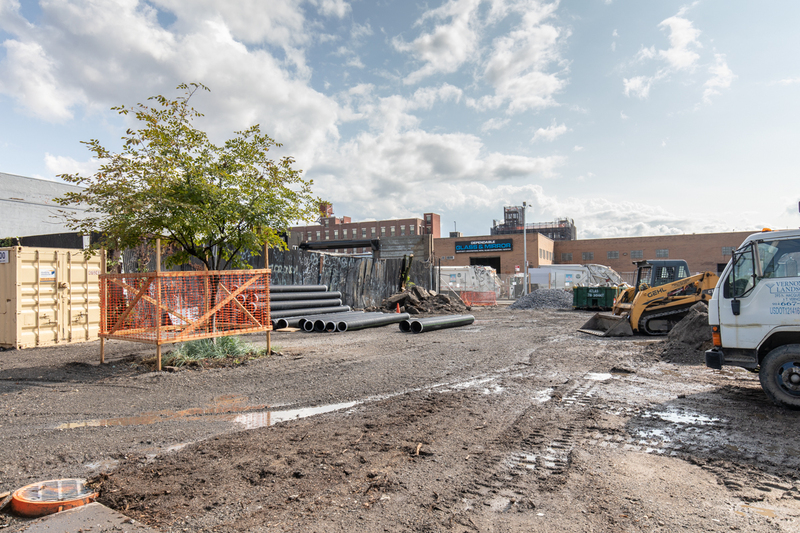 Ennis Playground sits at the edge of the bleak Southwest Brooklyn Industrial Business Zone (IBZ), where warehouses and manufacturers hug the polluted canal—away from residential Gowanus, which may be why the no-frills park was considered so quiet. Brad Lander selected the park, with its “cracked and unusable basketball court,” for the Participatory Budget Ballot in 2014. In another sign of changing times for the neighborhood, an art installation—a “parklet within a park” by Michael Clyde Johnson—was commissioned for the playground in 2015. 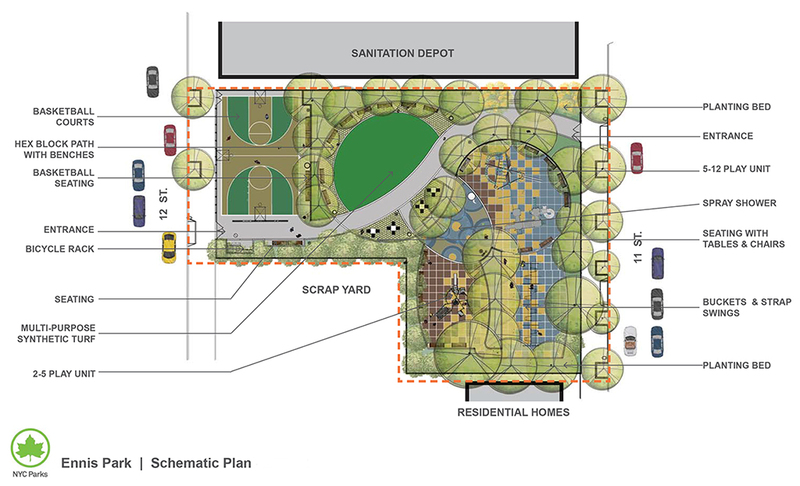 By January of 2016, a full renovation was planned with the community actively involved in redesigning the playground, settling on a final form later that year. Council Member Brad Lander gave copious thanks during the event to NYC Parks Brooklyn Borough Commissioner Marty Maher and his Chief of Staff Davey Ives for building a neighborhood consensus behind the playground design after multiple drafts. Trees and landscaping will conceal the neighborhood’s industrial surroundings. 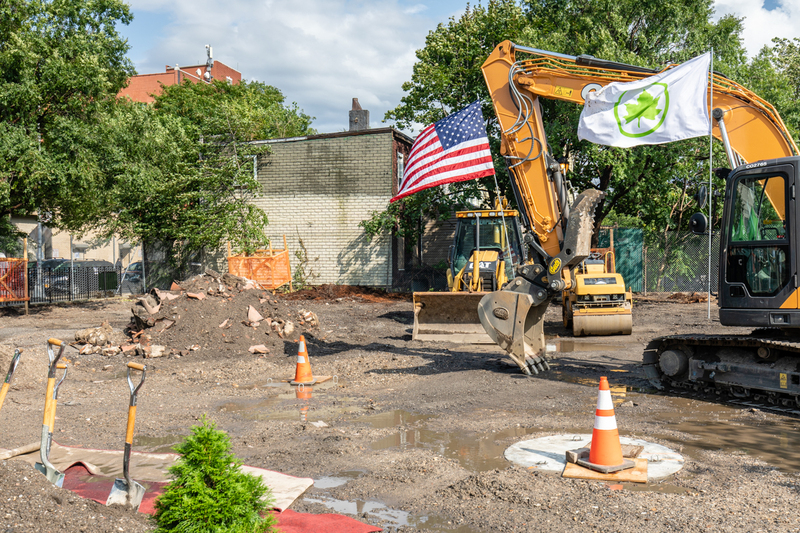 In the middle of the playground, a multipurpose synthetic turf field will serve double duty as “a storm water detention system…[to] reduce the load on the combined city sewer system,” a measure that will minimize the sewage overflow that winds up in the canal. In related news at another nearby park, work began in late July to upgrade the P.S. 282 Playground located on Berkeley Street between 5th and 6th Avenues in Park Slope. 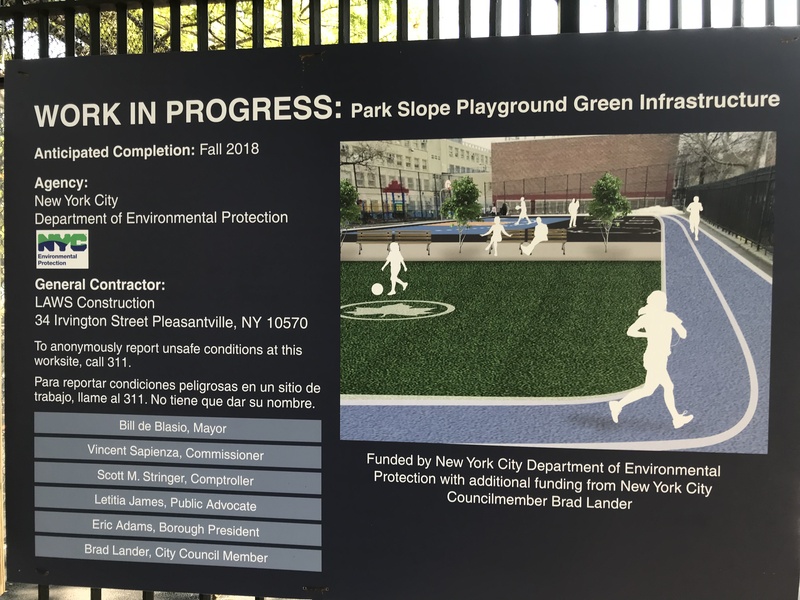 The NYC Department of Environmental Protection (DEP) and Council Member Lander announced last month that along with a synthetic turf field, running track, spray fountain/drinking fountain, basketball hoop, and benches, the playground would also be “transformed with the addition of green infrastructure and trees that [have] the storage capacity to capture nearly 1 million gallons of stormwater annually and help to improve the health of the Gowanus Canal.” DEP allocated $350,000 to the project and Lander committed $250,000. The “centerpiece” of the playground project is the “new synthetic turf field featuring a subsurface broken stone storage layer and perforated distribution pipes to promote infiltration.” Stormwater will flow toward the engineered drainage system beneath the field, decreasing the amount of stormwater in the neighborhood’s combined sewer system by up to 1 million gallons per year, reducing the combined sewer overflow into the Gowanus Canal. The P.S. 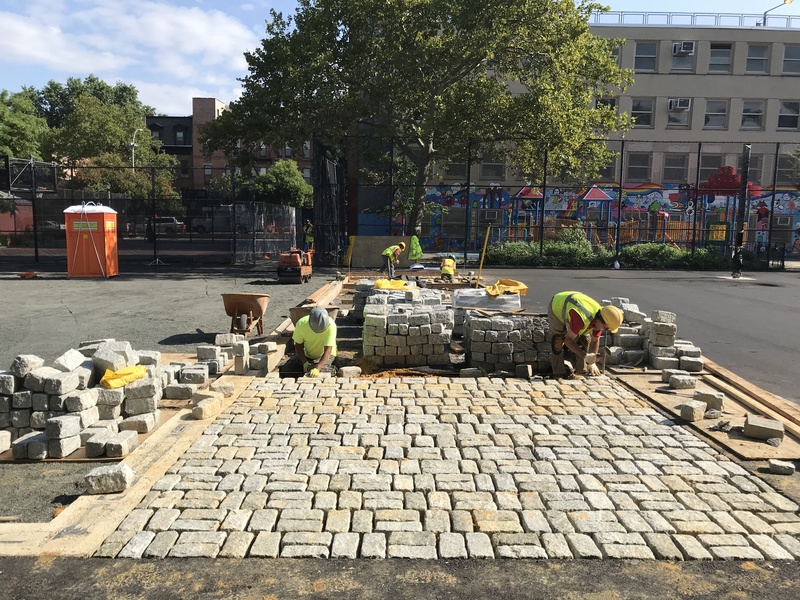 282 Playground upgrades are part of the DEP’s $50 million program to install green infrastructure design elements at Community Parks Initiative sites and rehabilitate more than 100 asphalt playgrounds across the city. The project is scheduled to be completed by the end of the year.